What sort of shoe does a pro photographer wear? éS Square Two Fusion, duh? 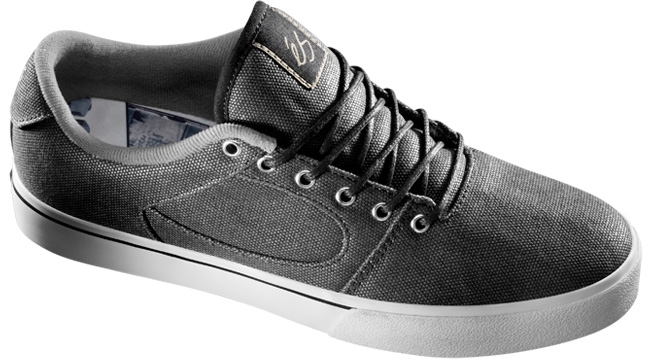 If you’re professional skateboard photographer Joe Brook this shoe was made for you. If you’re not Professional Skate Photographer Joe Brook, and just want a nice Vegan skateboard shoe, and would like to try out something other then a traditional Vulc or Cupsole then this shoe was also made for you. This Square Two uses a new footbed technology Sole Tech is calling stiFusion that you may have heard about if you pay attention to skateboard adverts. The idea behind the Fusion is that a stronger, lighter, cleaner show is created by some new fangled glueing and bonding methods. Awesome. We’ll see how they hold up in the field. Fancy Silver Waxed Canvas upper, One Piece toe caps,(so no unsightly stitching to come loose) And if your into photos on the insoles, your covered. Endless has them for 59.95 in 7-13, but no 12s. Joe Brooks you may be familiar with if you look at Skateboard adverts, or skate mag covers. Or just listen to some stories, kid.